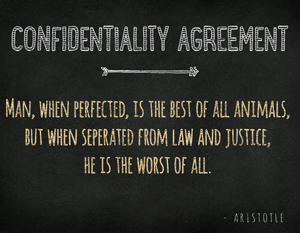 A confidentiality agreement, also known as a nondisclosure agreement, is a legal contract negotiated between two parties that outlines the confidential information, trade secrets, or other sensitive information the parties wish to share with one another without the fear that the information will be disclosed to a third party. Generally, confidentiality agreements are most often signed when two businesses, or two or more entrepreneurs looking to form a joint venture, are negotiating the terms in which they want to do business together and need to understand what each party is bringing to the table for the purpose of the business relationship. It is also possible for an employer to restrict an employee’s right to freely disseminate sensitive company information by using a confidentiality agreement or nondisclosure agreement. A confidentiality agreement (NDA) can be a crucial legal instrument for new Chicago start-up business during their development stages, or for a small businesses in Illinois in the process of negotiating the launch of a new product or service. As a business law firm, we are often called on by a variety of businesses and entrepreneurs to properly draft confidentiality agreements so that sensitive, valuable business information is not, intentionally or unintentionally, revealed to another individual or business without authorization. A confidentiality agreement is a legal contract negotiated between two parties that outlines the confidential information, trade secrets, or other sensitive information the parties wish to share with one another without the fear that the information will be disclosed to a third party.